A long-anticipated donut shop has finally arrived on campus and students will now be able to grab coffee and a variety of breakfast foods on their way to class. Tarleton State University’s Dunkin Donuts will open in conjunction with the first day of classes, Aug. 27. Operating hours will be Monday through Friday from 7 a.m. to 2 p.m. Along with this new dining addition, Tarleton students can expect even more options in the future. The new Dunkin’ Donuts is conveniently located in the Dining Hall. Photo by Quanecia Fraser. The store is conveniently located inside the dining hall, so students will no longer have to make the trek to the library café even if their class is in the opposite direction. The stand-alone Dunkin’ Donuts will feature a full menu of coffee, donuts and breakfast sandwiches. In fall 2017, Tarleton Dining Services posted a poll on Twitter asking which dining option students would like to see on campus next. The options included Dunkin’ Donuts, which received the most votes. After the results were finalized, the plan to bring donuts to Tarleton began. Tarleton Dining Services Marketing Coordinator Lina Betts said the students’ input on dining options is very important to her department. 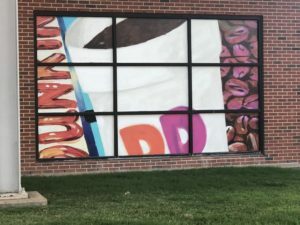 “Based on results from a survey Sodexo sent out in fall 2017 to students and faculty, the addition of a Dunkin Donuts was highly desired,” Betts said. The addition of the donut shop has been in discussion for two years, according to Kimberly Miller, general manager of Tarleton Dining Services. “We are excited about the growth and will continue to expand as the campus needs,” Miller said. The new campus Dunkin’ Donuts is only the beginning of Tarleton Dining Services’ expansion. With Memorial Stadium being renovated, Tarleton Dining Services is exploring the idea of placing permanent food trucks near the stadium. “That is in design phase now. We will offer a variety of different menus from burgers to tacos,” Miller said. When it comes to deciding the future of Tarleton’s dining options, Miller said her team will always get input from faculty and students first. According to Miller, Tarleton Dining Services’ mission is to be a premier dining service on campus and provide students with quality food and service. “We are here for the students and always want to provide them a quality service,” Miller said. Miller added that her department will continue to have Sodexo brands such as Mexican food and sushi concepts as well as national brands and will continue to offer a mix of options, while always looking at different options that fit students’ desires. “We are very excited to not only expand meal options for students but to also let them know that their opinion is very important to us in the future direction of their Dining Hall,” Betts added.